When she learned that violent clashes had broken out between Houthi rebels and forces loyal to Yemen's former President Ali Abdullah Saleh, a young woman named Amal tried to call home. She was outside of the country, at university, but knew the violence had occurred near her family's home in the capital, Sana'a. She tried to reach her family using various mobile messaging apps, and was surprised when she did not hear back from them or see them connected on Facebook. She began to fear the worst until she successfully reached them on the phone by the end of the day. Amal's experience, and many others like it, give a glimpse of how harmful internet service disruptions can be amid an armed conflict. Nearly three years ago, Yemen plunged into an armed conflict, with Houthi rebels fighting  to seize power from the internationally-recognized government of President Abdrabbuh Mansour Hadi, who is is supported by a Saudi-led coalition. Forces loyal to former president Ali Abdullah Saleh (who was removed from power following street protests in 2011) had fought against the Houthis, until Saleh changed his position and called for dialogue with Saudi Arabia. On 4 December, 2017, the Houthis killed  Saleh. Some days after the clashes between the Houthis and forces loyal to Saleh ended, internet users were caught off guard by a 30-minute internet shutdown, on 7 December between 10:30pm and 11:00pm local time. Internet service was later restored, but at the same time Facebook (one of the most popular sites in Yemen, according to the web traffic data and analytics service Alexa ), Twitter and the instant messaging applications WhatsApp, IMO and Telegram (which was previously blocked in 2016 before access to it was restored in early 2017) were blocked. Websites of news organizations affiliated with former president Saleh and the political party he founded, the General People's Congress, were also blocked. These blockages occurred at the hands of the Houthis, who hold control of the capital, Sana'a, and have taken control of the Ministry of Communications and Information Technology. The Ministry controls Yemen's DNS servers and the country's sole internet service provider, YemenNet. Six days later, on 13 December, YemenNet lifted the ban on social media platforms and messaging apps, though internet speed continued to be significantly slower than normal. In July 2016, the United Nations Human Rights Council adopted a historic resolution  condemning internet shutdowns as a violation of human rights. In a state of war, internet and communication platform outages can put basic rights at even greater risk. 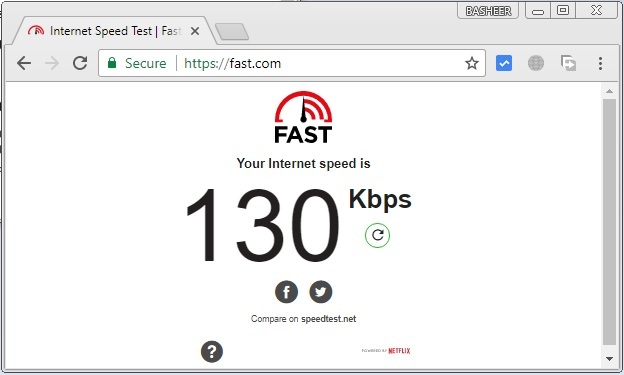 According to a test  conducted on 18 December using the internet speed testing service Fast.com, Yemen's internet was operating at a download speed of 130 kilobytes per second (0.13 megabytes per second). This is ten times slower than its average speed, which is already slow. Intentionally slowing internet speed is among the measures employed by regimes to repress the digital rights of users. Al-Baheth added that ending YemenNet's monopoly over the provision of internet services would be one solution to address the current issues related to internet access in Yemen. Before Thursday's shutdown, the Houthis had also been throttling, or intentionally slowing, internet speeds across the country, according to several online sources  who complained  that the internet has been particularly slow. Walid al-Saqaf, co-founder and chairman ISOC-Yemen, told SMEX that YemenNet regularly throttles the internet and that this practice continued during these two disruptions. Recently, Yemeni internet users have been trying to find internet circumvention tools  to bypass censorship. Some are using virtual private networks  (VPNs) to communicate and exchange news with their families and friends inside and outside Yemen, even though these tools can sometimes slow down their internet speed. A number of users started using the secure messaging app Signal , since it was not among the blocked apps. Yemeni authorities have a long history of violations against freedom of expression and opinion, and the right to access information. Such violations date back to the rule of former president Saleh, when the government started blocking websites affiliated with the opposition from 2005 until 2011. In 2012 the ban on all websites was lifted. However, with the start of the latest war in 2015, the Houthis who control the capital, where DNS servers are located, blocked  access to several Yemeni and regional news websites that oppose their policies. In May 2016, they blocked  Telegram and Instagram for several months, and in October of the same year WhatsApp was blocked  for several days. The internet was first made available for public use in Yemen in 1996 through YemenNet, a company affiliated with the (Houthi-controlled) Ministry of Telecommunication and Information Technology, which is still the only service provider in the country. According to the Public Telecommunication Corporation  (the government-owned company which manages the fixed-line and mobile networks), there were 4.2 million internet users in Yemen by the end of 2015. According to Internet Live Stats , that number increased to reach 6,773,228 users in June 2016, that is 24.7% of the population. Currently, the internationally-recognized Hadi government, which is based in the Governorate of Aden, is seeking to separate the areas it controls by establishing DNS servers in Aden and connecting the province through an international submarine cable. If successful, this measure could end  the Houthis’ monopoly over the telecommunication sector. This may result in an end to censorship and increased internet speeds in the areas under the control of Hadi's government, unless it also chooses to practice censorship and surveillance, and to slow down the internet. An Arabic version of this article was first published  on the Arabic blog of Mada19 on 20 December. 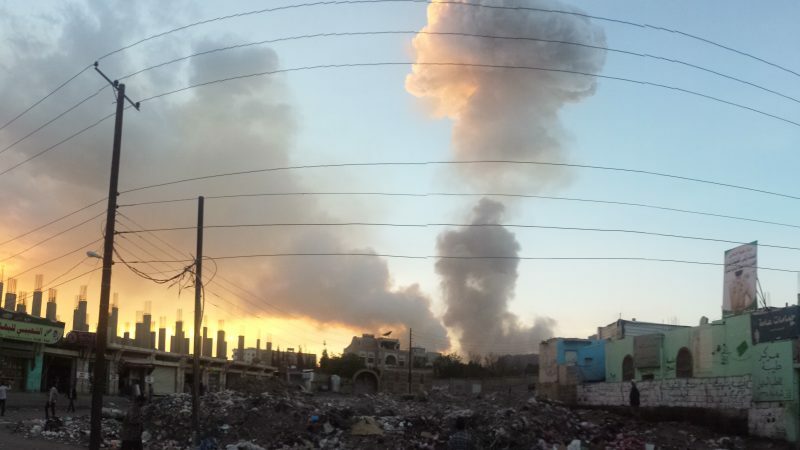 Global Voices re-published and edited the article at the request of its author, Bahseer Alsamawi, a Yemeni activist who documents rights violations committed against civilians during the ongoing war.